The response to my inquiry regarding Bennett's Pies (in a previous edition of the Walkerville Times) was overwhelming. I received telephone calls from twelve individuals including former workers, friends and associates of the now defunct Bennett's Pies, and from some direct descendants of the Bennett family. 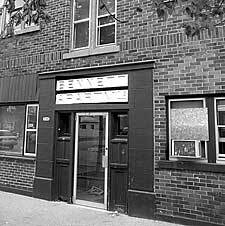 The Bennett Bakery was located on Ontario Street between Monmouth and Argyle Streets. The business was run from the adjacent building west of the Bennett apartment building. To this day, the Bennett name is emblazoned on the front of the building as a lasting memorial to the Bennett family. It pleases me to tell you that the Bennett's were hard working and very friendly folks. Not one unkind word was spoken about them from the many callers who contacted me. I've managed to compile a recipe of mixed sorts by using all the relayed information. The basic recipe was quite simple but due to many variations, a simple task became quite complex. For any readers who might be interested, I share the results of my findings. Remember now, this is a BASIC recipe (see sidebar). In some cases, sage was offered as a seasoning but in no specific quantity. One caller suggested using cold, mashed potatoes as a substitute for the bread crumbs. I experimented using the bread crumbs with very satisfactory results. The "secret" to any pie is to ensure that the filling is cold before the pie is assembled. Most callers offered that advice in mutual agreement. In addition, most advised that lard, not shortening was used by Bennett's to make the pastry. In addition, their meat pies were completely assembled before baking. My experience has shown that a meat pie of this nature is best cooked in a 375F oven for 45 minutes or until the top crust is golden brown. It was also pointed out that water was used to seal the top crust to the lower one to prevent the meat filling from escaping during baking. I remain graciously indebted to all those who contacted me. Every caller was sincere, friendly and so happy to be able to offer their opinions. I could not help but feel so privileged to be an attentive listener because in every case, their phone manners and sincerity were impeccable. It seems in today's society, GOOD manners are almost forgotten. Again, I remain deeply indebted to all who took the time to call me. I simply cannot say, "Thank you!" enough.